How can quality childcare build a stronger future for all of us? 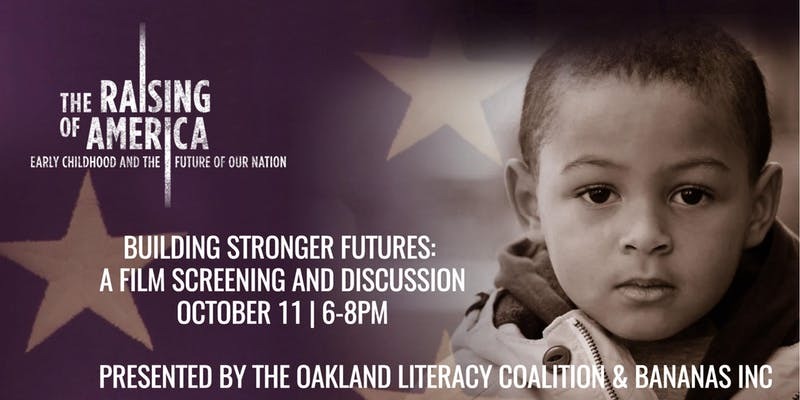 Join the Oakland Literacy Coalition and BANANAS INC. for this important and timely conversation about the state of childcare and early education in our city. We will be showing part one of the film “The Raising of America” and hosting a dynamic panel discussion of local parent advocates and childcare providers in conversation about our current childcare and early education crisis— and how an investment in our youngest children can build a stronger future for us all. This event is free and open to the community. Please help us share this event with families! Food and beverage, including beer and wine are available for purchase. We will begin promptly at 6 PM. Please arrive early to get a seat. Click here to watch the 30 second trailer!